Flash video banners are a great way to get attention and encourage clicks. 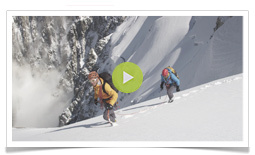 Adding ambient video banners to your website encourages visitor engagement with your content. They can be used to promote important messages and increase the overall stickiness of your site. For online advertisers, video MPUs are also more effective than traditional ad units and can increase click-through by as much as 600%. Flash video banners can be created in custom sizes and as stand-alone outputs. Plus if you’re already working with us to produce a video, we can repurpose the content to give you a cutting edge banner for your site.